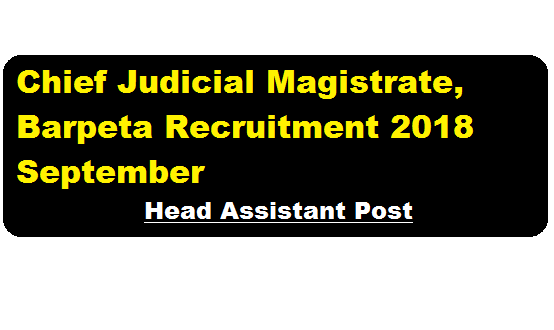 Chief Judicial Magistrate, Barpeta Recruitment 2018 September | Head Assistant Post :- Chief Judicial Magistrate Barpeta has published a recruitment notification in September 2018.Application in the prescribe Standard form are hereby invited from suitable candidates for filling-up the post of Head Assistant in the scale of Rs. 22,000 -87,000/-, Grade pay Rs. 9100/- per month plus other allowances as admissible as per rule in the establishment of the Chief Judicial Magistrate, Barpeta. The details of the vacancy is found below. In this section, we will discuss in details about the recruitment of Head Assistant Post under Chief Judicial Magistrate, Barpeta Recruitment 2018 September with vacancy details, eligibility criteria, salary with other details and requirement. Educational Qualification: Candidates are required to have possessed at least 10(ten) years of experience in the service as Upper Division Assistant or Supervisory Assistant in any Chief judicial Magistrate establishment within the state of Assam (Ministrial). The Application supported by all necessary certificates and testimonials should reach to the undersigned on or before 15.10.2018 through proper channel. No T.A. or D.A. will be admissible in this regard.